See step 4. If not chilling the cookie dough, preheat oven to 375°F (191°C). Line baking sheets with parchment paper or silicone baking mats. Set aside. Whisk the flour, baking soda, and salt together in a large bowl. Set aside. Whisk the melted butter, granulated sugar, brown sugar, honey, egg yolk, milk, and vanilla extract together until combined. Pour into dry ingredients and mix everything together until completely combined. Fold in the chocolate chips. (You can use a mixer for this step if needed.) Dough will be soft. For thin and crisp cookies, do not chill the cookie dough and proceed with step 5. For slightly thicker and crisp cookies, cover and chill the cookie dough in the refrigerator for 1 hour then preheat the oven. 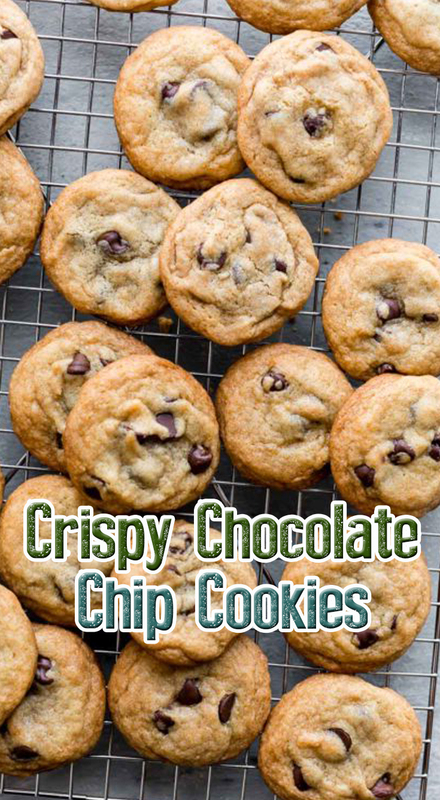 For slightly thicker cookies with soft centers and crisp edges, cover and chill the cookie dough in the refrigerator for 2 hours then preheat the oven. Roll cookie dough into balls, 1 scant Tablespoon of dough per cookie, and arrange 2 inches apart on the baking sheets. Bake for 10-11 minutes or until browned on top and around the sides. Remove from the oven and allow cookies to cool on the baking sheet for 3 minutes before transferring to a wire rack to cool completely. Cookies crisp up as they cool.